Stuart Sanderson, president of the Colorado Mining Association, kicks off a series of presentations Tuesday at the Colorado Coal & Power Generation in Craig. Sanderson said the state of coal in 2012 looks good in the world markets despite President Barack Obama and the Environmental Protection Agency’s “war on coal” in the U.S. The Clean Air, Clean Jobs Act, sage grouse, and more stringent air quality regulations from the Environmental Protection Agency are among some of the concerns facing Northwest Colorado coal producers, industry officials said Tuesday. State and local representatives from the coal and power generation industries addressed those concerns during the Colorado Coal & Power Generation Conference at the Holiday Inn of Craig, 300 S. Colorado Highway 13. The annual event, hosted in recent years in Craig and Steamboat Springs, attracted more than 70 people and provided industry officials the opportunity to address the affects government regulations could have on their ability to deliver reliable electricity to American consumers. The conference featured two separate panels of speakers, including Stuart Sanderson, Colorado Mining Association president; Jerry Nettleton, environmental manager at Twentymile Mine; Rick Johnson, manager of Tri-State Generation and Transmission Association, Inc.’s Craig Station; and Chris McCourt, manager of Colowyo Mine, among others. 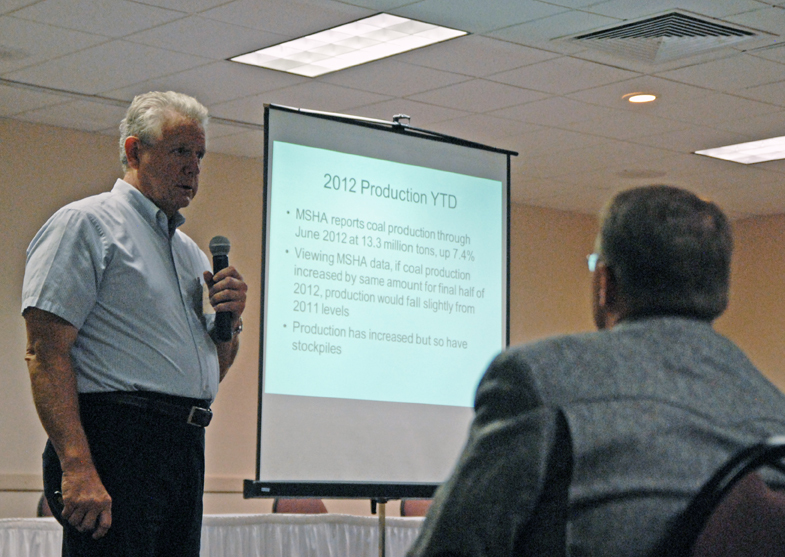 After a brief welcome address by Moffat County Commissioner Audrey Danner, Sanderson delivered a presentation on the state of coal in 2012. Yet, despite a growing domestic shift toward natural gas and increased investment in renewable technologies, Sanderson said the state of coal is not as bleak as it may seem, especially when looking beyond American markets. Sanderson cited developing nations like India and China, two countries embracing coal as a reliable source of energy. History may be playing a factor in the attraction of coal overseas, Sanderson said. Johnson played off Sanderson’s historical reference. “Look at all of the underdeveloped countries that are anxious for coal and natural resources to develop their countries into what the United States of America used to be,” he said. Johnson also discussed costs Tri-State Generation and Transmission Association, Inc. will incur if the EPA approves in September the State Implementation Plan of the Clean Air, Clean Jobs Act. According to that plan, Craig Station would be required to install a selective catalytic reduction device, in addition to other equipment upgrades, aimed at reducing the power plant’s nitrogen oxide and sulfur dioxide emissions. If approved next month, Craig Station would have five years to comply with the new regulations. The new equipment and upgrades carry an estimated price tag of $300 million, plus $10 to $15 million in annual maintenance and repair costs. Because Craig Station is a cooperative member of Tri-State, those costs would likely be passed down to consumers in the more than one million homes and businesses powered by the 1,311 megawatts of electricity generated in Craig, Johnson said. It’s a significant cost to pass on to consumers, he argued, considering the Clean Air, Clean Jobs discussion was focused on visibility issues, not health or science-based concerns.